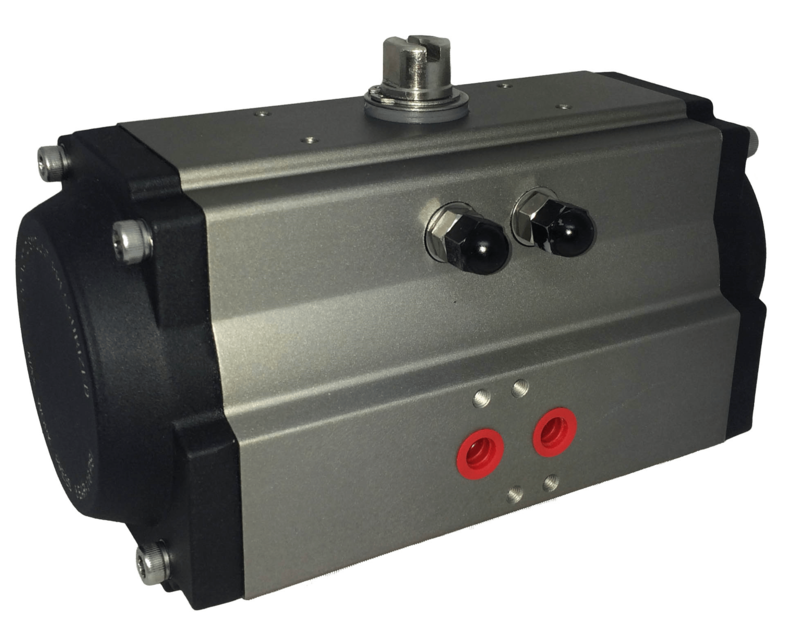 CH-air pneumatic actuators offer a range of rack and pinion actuators covering either EU manufactured high-quality actuators or a low-cost import where price sensitivity is the main consideration. Healthy UK stocks of all models are kept for day to day requirements with bulk stocks held in western Europe. CH-air A Type pneumatic actuators are high-quality EU designed and manufactured actuators available with 17 models providing a maximum double acting torque of 13,300Nm. Special body coating options give ENP and Teflon™ coated versions, plus offshore epoxy painting on request, and with a forged stainless steel version too, most applications in most industries are covered. CH-air A type pneumatic actuators are ISO9001 manufactured, CE marked, ATEX approved and SIL 3 rated, and conform to Namur, VDI/VDE 3845 and ISO 5211:2017 international standards. CH-air C Type pneumatic actuators are a lower specification version from China that offers an exceptional quality to value ratio, and have 17 models producing a maximum of 14,400Nm. No body coating options are available. The CH-air C type pneumatic actuators are ISO9001 manufactured and are ATEX approved. All CH-air actuators conform to the international standards and provide Namur interfaces, ISO 5211:2017 and VDI/VDE 3845 mounting that facilitate the direct mounting of valves, and position control, monitoring and feedback devices. Namur solenoid valves, limit switch boxes and pneumatic positioners can all be quickly mounted to the actuators. CH-air pneumatic valve actuators are of a standard rack and pinion construction, pistons with an integral rack, drive a pinion and create the rotary motion needed to open and close a quarter turn valve. Compressed air can be supplied and exhausted from either side to drive the pistons which then rotates the pinion. The final positions of the actuator are set using adjustable mechanical stops within the actuator. Pneumatic valve actuators are fast acting, can be operated continuously, and are comfortable in very high cycling applications.